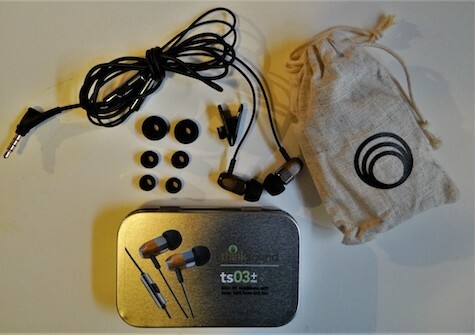 The newest in-ear headphones from thinksound, the ts03+mic, improve upon this company’s previous offerings. These earbuds are wired earphones with a built in microphone and single button music/phone control. The the ts03+mic are listed at $120 U.S., and from the outward appearances are similar to the other four styles thinksound sells. There is a nice little video on thinksound’s website that shows the best way to keep those darn wires from getting tangled every time you put them away. Try it — I like it! The packaging is a simple metal box similar to an Altoids container. Inside is the earphones and a small cloth drawstring bag containing the four sizes of earpieces and the cable clip. The bag will be the storage container for your earphones in the future, unless you prefer to use a more protective case from another company, or a small Ziploc bag. 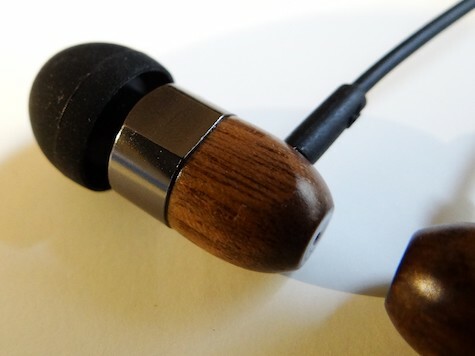 I have been using a pair of thinksound’s Rain3 earbuds for months and they are my go-to listening device. When I was able to try these ts03+mic expected the new set to very good. I was not disappointed! As good as the Rain3 are, the ts03+ are noticeably better. I plugged them into my iPhone and immediately said WOW! Listening to Pierre Bensusan’s “Agadir Ramadan,” a song that goes from an ethereal guitar and bass to jazz influenced world music, ts03+mic handled it all with aplomb. The bass, which is often lacking in earbuds, is deep and clear, and Bensusan’s guitar sounds like it is in the room. When he whistled a few lines of the tune I could sense his lips puckering. Listening to a few other styles of music I found the ts03+mic earphone never let me down. On Jennifer Warnes “Famous Blue Raincoat” from the Songs of Leonard Cohen from the mid 80’s, the old vinyl was brought back to life. I could hear Billy Youdelman’s engineering proficiency along with some great guitar work by Stevie Ray Vaughn punching through, not to mention Jennifer’s sublime vocals. 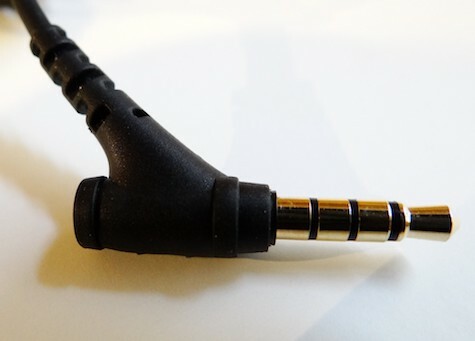 When talking on the phone I like using only one earbud. The sound with ts03+mic was clearer than using the phone to my ear and my caller thought that, on his end, the sound was just as good as using the phone alone. Holding the single button for a few seconds brings up Siri and you can call by using this function. The other functions are a quick press to pause/unpause music or answer an incoming call. The control is compatible with iOS and Android devices. If you are looking for great sounding, comfortable earphones look no further. At $120 these are a great value. Learn about thinksound’s recycling program (on the website above) for earphones being replaced or not working any more and save 15%. 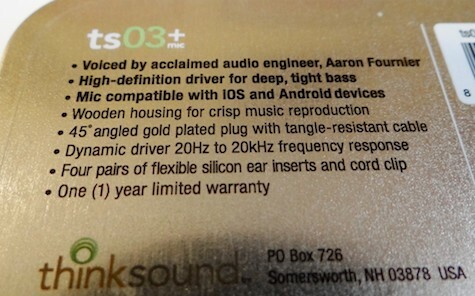 In the earbud world the ts03+mic scores a rare perfect MyMac Review Rating 10 out of 10 because of the sound quality, fit, and value.